The channel strip modules offers that epic pro console sound that let you turn your song into a hard hitting, radio ready production. The channel setting window sports sophisticating signal metering, quick routing assignments and full fledged signal processing section. The sampler track is the fastest way to inspiration. Just use any peice of audio to create a sampler track, play the sample chromatically, munipulate it with the on board filters and controls, and start experimenting. The arranger track is a great tool for arranging your project by marking out section and determining in which order they are to be played back. Those of you who don’t know Cubase, it’s our digital audio workstation for professional multi-track audio recordings. 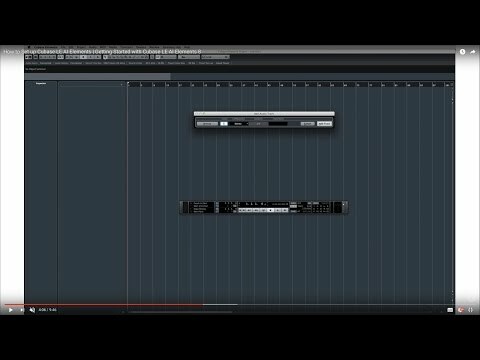 In this video tutorial we will be talking about installing Cubase, we’ll go over basic operations and see to it that you connect the music software with a MIDI interface, a microphone and other gear. Only after you’ve set up Cubase can we start to learn how to record music, so don’t procrastinate and get going!